In June 2009 before my hearing, I visited the then Shadow Transport Secretary Norman Baker in his Chambers at the House of Commons. I presented Mr Baker with a dossier highlighting the IGNORANCE of TPE Management towards the failure of the Class 185 warning horns in cold weather. At the time he seemed quite disturbed by my dossier and said he would raise the issue with First Group, after my dismissal Norman Baker said he would assist me with legal representation via the "Pro Bono Unit". Norman Baker then has a meeting with Vernon Barker and ignores all my correspondence. This man is now the Transport Secretary, he will one day regret his actions because TPE is a ticking time bomb, its only a matter of time before the blast. You cannot possibly run a business having to rely upon luck, Summit Tunnel was the biggest slice of luck ever, please remember, YOU HAVE ALL BEEN WARNED! 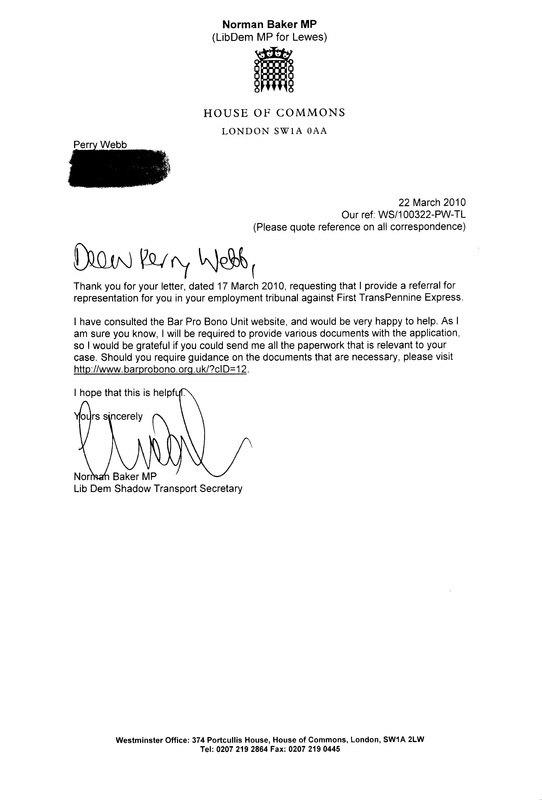 Below is the letter from Norman Baker to myself. 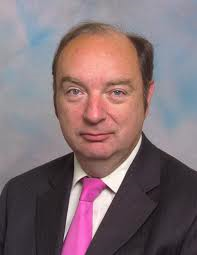 Why would Norman Baker IGNORE me after promising to help? Why would the Tribunal change my Judge just 3 days before my hearing? Why would the new Judge, namely Judge David Burton prevent me from reading my witness statement? Why would the same Judge allow Watson & Atkinson to get away with PERJURY? Why did the Tribunal fail to send me Judge Burton's written Reasons till months later? Why did the Appeal's Tribunal fail to process my appeal which was put in within timescales? The answer to the numerous WHY'S is simply - "THE ESTABLISHMENT". As I told this man and as history has now shown, people have lost their lives through the very IGNORANCE I encountered and through the incompetence of an inept company and its leadership. My QUEST for JUSTICE will never cease.